Rebecca Gibb, my editor at Wine-Searcher.com, asked a few of us to nominate our “wines of the year” for 2013 and I was happy to add my voice to the chorus. My selection — the 2012 first vintage of Eroica Gold Riesling from the Columbia Valley, Washington — was complicated. That’s where Eroica Gold stands out for me. It is different from most of the other American Rieslings that are produced in sufficient volume to enjoy wide distribution and so represents a potential step forward in this rising marketplace. Eroica Gold is made in the style of a German Gold Capsule Auslese Riesling. About a third of the grapes were Botrytis infected. Sweetness and acidity are nicely balanced and the orange marmalade aromas and luscious texture are memorable. This is Riesling for adults, that’s for sure, and my hope is that this joint venture between Chateau Ste Michelle and Dr. Loosen will open up a new market segment for Rieslings of this style. Eroica Gold surprised me and working on the Wine-Searcher project got me thinking about other surprising or Extreme Wines (to engage in a bit of shameless self promotion for my new book of the same name). Herewith a quick accounting of some of the other wines that got my attention, focusing on Australia, which we visited back in September. The Adelaide Hills get less attention than some other Australian regions, but it provided three wines that made me stop and think. Two of them were made by Larry Jacobs at his Hahndorf Hills Winery. A medical doctor by training, Jacobs immigrated to Australia from South Africa where he founded Mulderbosch. He seems to think outside the box when it comes to wine — how else can you explain the Gruner Veltliner and Blaufrankisch (or Lemberger) that we tasted? You might think that it was a simple typographic error (easy for auto-correct to mix up Austria and Australia), but it was obviously a carefully calculated move. The 2012 Gruner was in fact named the best wine of its type from outside Austria! Quite a distinction. I love Rieslings and Pinot Noir and the Adelaide Hills boasts many fine examples of these wines (we especially enjoyed the wines of Ashton Hills). But it was an Adelaide Hills Shiraz that we tasted at Charles Melton in Barossa that made me stop and think. “Voice of Angels” it is called and it comes from a vineyard at Mt Pleasant. A very cool site and a very distinctive wine made, I was told, by co-fermenting the Shiraz grapes with a bit of Riesling from the same vineyard. Did I really hear that? Shiraz and Viognier, yes. Shiraz and Riesling? Maybe my memory is playing tricks on me, but in any case this was a wine to remember! Sue and I were fortunate to be able to taste three of Australia’s most iconic Shiraz wines: Torbreck, Penfolds Grange and Henschke Hill of Grace. They were all memorable, but in different ways. 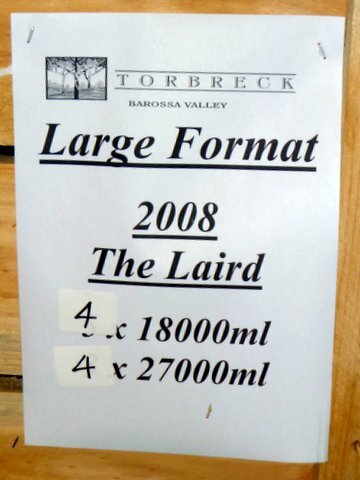 Our favorite Torbreck wine was a cool climate Eden Valley Shiraz called The Gask — just stunning — but I was stunned again by a sight not a taste when we toured the winery. There, hidden away, was a bin containing giant 18- and 27-liter bottles of The Laird (which sells for about $900 for 750 ml). 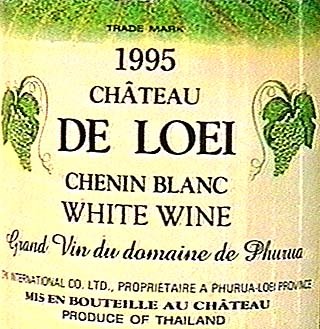 The idea of a 27 liter bottle of this wine — called a “Primat” according to one source and equivalent to 3 standard cases — floored me. I think I was told that the glass bottle alone cost about $2000 and that once filled it might be worth as much as $40,000 to a collector. Quite a trophy! I’ve inserted Sue’s photo of the whale-sized bottles below. Grange and Hill of Grace are particularly interesting to me because they are in some ways the ying and yang of top flight Australian Shiraz. Hill of Grace is a single vineyard wine and Grange is a multi-vineyard, multi-district blend. Year after year Hill of Grace comes from the same vines in the same valley (not a hill — the vineyard’s named for the church across the road) while Grange mixes things up a bit each vintage in the search for a particular style. Two different approaches to extreme wine-making. Listening to Stephen and Prue Henschke talk about their wine made me understand that while the Hill of Grace is a single vineyard in the way that we define these things, it is in fact a very complicated and varied site. The old vines there seem to be able to draw out the variations and the complex and distinctive blend results. Both Grange and Hill of Grace were memorable, but I must admit to a preference for Hill of Grace. Maybe it is because I tasted more different vintages of this wine or perhaps it is because it comes from Eden Valley, a cool climate area. Or maybe its the site and the power of those old vines. Can Australia produce terroir wines? No doubt about it! If I may permitted one more extreme wine for this column, I think it must be the Domaine A Cabernet Sauvignon from the Coal River Valley in Tasmania that we tasted with winemaker Peter Althaus on a drizzly foggy day. Tasmania is one Australian region that doesn’t have to worry about having a cool climate (at least for now). Althaus scoured the world for a chilly and distinctive site for his vineyard and moved here from Switzerland once he found it. Each of his wines breaks a barrier of some sort — the Pinot Noir perhaps most of all — and the Cabernet is quite an achievement. Another extreme and memorable experience! Can’t wait to see what 2014 has in store! Thanks to Kym and Bron Anderson for our tour of the Adelaide Hills. Thanks to Savour Australia for giving us the chance to taste so many vintages of so many extreme wines. Thanks to Dr Loosen and Chateau Ste Michelle for introducing us to Eroica Gold at Riesling Rendezvous. Thanks to Scott McDonald for the tasting and tour at Torbreck. Special thanks to Stephen and Prue Henschke for their hospitality in Adelaide. Decanter, the self proclaimed “world’s best wine magazine,” is “relaunching” its Buying Guide section in an attempt to make wine ratings more transparent and therefore useful to its global audience. You can read all about the new tasting panel protocols here. Instead of listing a single rating score for each wine, for example, Decanter will now provide the individual scores of three critics. I wasn’t sure if this would make much of a difference, but having read through the new issue, I am a fan. Let me take the big review of Rias Baixas Albarino as an example. Each of the tasters also provided notes for their “top three” recommended wines and John Radford wrote a brief essay to sum things up. Result: There is a lot of information here and a sense of a wine conversation rather than a monolithic judgment. Great new format. 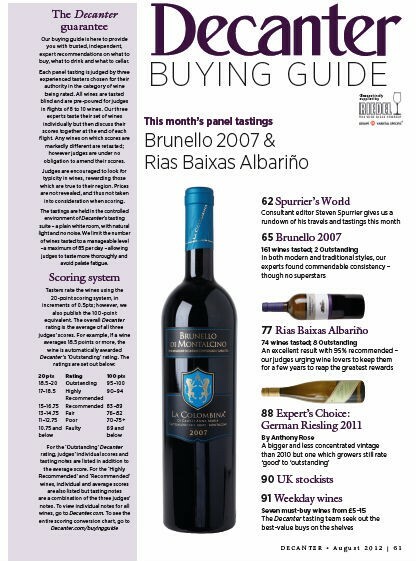 For as long as I have been reading Decanter the wine ratings have had three components: a brief but useful tasting note, a numerical rating on a 20 point scale and finally an overall assessment of zero to five stars. Of these three the tasting notes are the most useful for serious study while the star system works well for me as a potential buyer. I’m not sure I can taste the difference between 15.5 and 16.0, but knowing what’s Good, Better and Best (my casual interpretation of three, four and five stars) is something I can use. 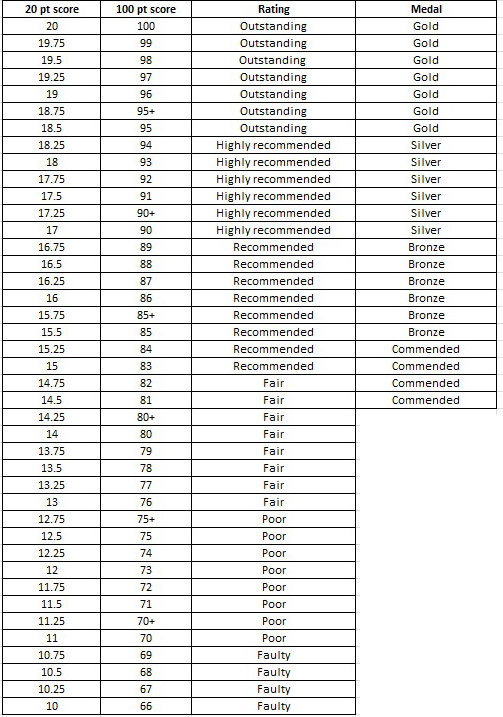 But Decanter’s scoring system has changed. Here’s a quote from the press release. Perhaps the most significant new feature is the adoption of the 100-point score, to run alongside Decanter’s 20-point score, while the old five-star system has been dropped. Introducing the 100-point system is essential as Decanter is now a global magazine with more than half its readership outside the UK, [editor Guy Woodward] says in this month’s editorial. Readers can now ‘use whichever [scoring system] they are more familiar with’. Fair enough — although “essential” is pretty strong — but I’m going to miss the simplicity of the old five star system and I’m not really sure that I need to have the 20 point British scale translated into a 100 point American equivalent. Converting Decanter scores into Wine Spectator-type figures and back again isn’t exactly rocket science (see the conversation table below). But I don’t see any harm in it, especially if, as the Decanter story suggests, the point is to help “global” readers who may be unfamiliar with the 20 point system to make sense of the ratings. It’s good to step back and rethink things like this every so often, but maybe Decanter’s relaunch didn’t go far enough, so in the spirit of Jonathan Swift, I’d like to offer a “Modest Proposal” for future reform. Here’s my idea. Instead of asking critics to score the wines on a quality scale, let’s ask them how much they are worth! How much should someone be willing to pay for this wine? Wine reviews generally tell us a wine’s price and a score, but what we really want to know is if it’s worth it. That’s the question that a lot of shoppers want answered and the question they are often trying to figure out when they read critic reviews. From a practical standpoint, don’t you think it would be more useful to translate scores into bucks rather than messing around with 20 points versus 100? Yes, yes, I know there are lots of problems. A wine that tastes good enough to sell for $20 to you might only taste like it’s worth $12 to me. But that’s nothing new — differences in taste and the problem of what economists might call “interpersonal utility comparisons” are part and parcel of all wine rating systems. Income distribution is a more difficult question, however. Mitt Romney has mega-bucks, so me might be willing to pay a lot more for a given bottle of wine than I would. That would mess up the ratings if he were a wine critic. But, hey, Mitt doesn’t drink wine, so … problem solved! There would be lots of benefits to this new system. Easy to use — just compare the price score ($15) with the market price and you know if the wine is “worth it” or not. Under a set of ridiculously improbable theoretical assumptions that I won’t explain here because it would put you to sleep, the gap between price and critic-assigned value would be equivalent to the welfare economics concept of “consumer surplus” and so the scores would allow consumers to more efficiently maximize utility and achieve a Pareto Optimal resource allocation. And while this doesn’t really work in theory, it is how many people behave in practice. How many times have you heard someone brag that their $10 wine tastes like it should cost $20? And although this is a silly thing to say, I believe many people really enjoy the benefit they think they have gained from that value-price gap. So the new system wouldn’t change that way of thinking — just improve it. We’d be drawing upon expert opinion for judgment rather than our own amateur assessments. Yes, I know this is crazy, but that’s the point. Jonathan Swift’s original 1729 modest proposal — that the rich should eat the children of starving Irish peasants — was also crazy, but the point was very sane. The cost of food (due to the high rents that landlords collected, according to the author) was already killing children in Swift’s day. As he said, the landlords had already “eaten” the parents through outrageous prices — might just as well go after the children next. My wine rating reform is crazy, too. You can’t use money to rate wine. Wine doesn’t taste like dollars — it tastes like wine! But, that’s my point. 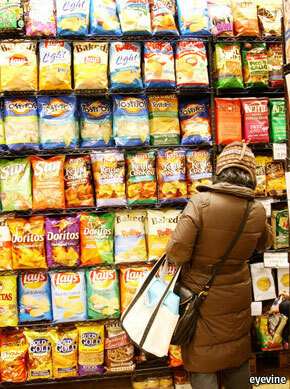 It doesn’t taste like dollars, but it doesn’t taste much like points, either, however useful consumers and producers might find the ratings to be. Hey, don’t get upset. It’s just a modest proposal! Here’s the Decanter conversation table. Cheers.